In most years past I have missed the Christmas specials that are shown on TV, either because of other plans, or simply due to the fact that I never knew they were on. 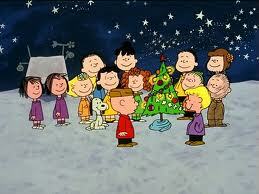 I love Charlie Brown, the Grinch, and of course Rudolph, and I was always bummed when I missed another showing. So, already this year I've seen a few and am totally ecstatic! As I get more and more into the Christmas spirit, I thought I would share some of my favorite holiday traditions. It's not a cartoon, but Emmett Otter's Jug Band Christmas is my favorite kid's special. I have never seen this on "regular" TV, but you might find it on a cable or satellite channel. I bought the DVD and watch it every year! I am a traditionalist when it comes to Christmas music. The Christmas Song sung by Nat King Cole, White Christmas sung by Bing Crosby, and Holly, Jolly Christmas sung by Burl Ives are some of my favorites. The only exception to my "traditional" music is Trans-Siberian Orchestra. I've seen their Christmas show 3 times and loved it each time. Holiday Inn, with Bing Crosby and Fred Astaire, is my favorite holiday movie. Technically I wouldn't classify this as a Christmas movie, but Bing does sing White Christmas, and I always watch it this time of year. As far as food treats, I'm getting ready to make cookies within the next week. I don't make very many, and tend to mix them up every year. Because a lot of my "cookie exchange" friends tend to make cookies with chocolate, I usually stick to making cookies without. But, as far as traditions go, I always make Chex Mix ... can't have Christmas without it! The snow will start flying soon and I will be ready with a classic movie, Chex Mix, and a bottle of wine. What are some of your Christmas favorites?